Clinton Davisson discovered electron diffraction, for which he was awarded the 1937 Nobel Prize in Physics. His discovery confirmed the de Broglie hypothesis that particles can behave as waves. A brilliant and careful scientist, financial difficulties interrupted his undergraduate studies; it took him six years to get a B.S. in physics. However, with only one year of undergraduate study at Chicago under his belt, he began teaching physics at Purdue University. During World War I, he worked on war projects at Bell Laboratories. His fundamental knowledge proved so valuable that the company created a special pure research position for him when the war ended. He enjoyed such success in this role that Bell began employing ever more pure scientists. Davisson is regarded as the father of fundamental research at Bell. Clinton Joseph Davisson was born in Bloomington, Illinois, USA on October 22, 1881, just four days before the notorious gunfight at the O.K. Corral in Tombstone, Arizona. His father was Joseph Davisson, a housepainter who had once fought in the Union Army. His mother, Mary Calvert, was a school teacher. Clinton had a younger sister Carrie, born four years after him. Educated in Bloomington’s public schools, in 1902, age 20, Clinton Davisson won a math/physics scholarship for the University of Chicago; he enrolled shortly before his twenty-first birthday. An inherently shy young man, when his photo and a story celebrating his scholarship appeared in a local newspaper, he avoided his normal route home to escape any attention. The scholarship enabled him to continue pursuing a lifetime fascination with physics. As early as elementary school, he had experimented with homemade batteries and electric coils. Later, he and a friend built a telegraph system between their houses and communicated using Morse code. Davisson’s scholarship to Chicago only supported him for one year, after which he returned penniless to Bloomington where he found work with a telephone company. Davisson’s future in science might have ended there, but fortunately Chicago’s future Nobel Prize winning physicist Robert A. Millikan had recognized Davisson as a remarkably talented student – so talented that, when he heard a physics teacher at Purdue University had died unexpectedly, he recommended Davisson as a stand-in. Davisson spent the first half of 1904 teaching at Purdue University, earning enough to pay for a second year at Chicago. At the beginning of the 1905-1906 academic year, he became a physics instructor at Princeton University in New Jersey. This was rather unusual, because he still did not have a degree. However, Millikan’s recommendation was sufficient for Princeton to offer him the job. Davisson returned to Chicago during three summer vacations (1906-1908) to obtain his B.S. As an instructor at Princeton, he spent most of his time working as a research assistant to the British physicist Owen Richardson, who would later win the 1928 Nobel Prize in Physics for his work on thermionic emission. In 1911, age 29, Davisson secured his Ph.D. His thesis title was: The Thermal Emission of Positive Ions from Alkaline Earth Salts. The year 1911 turned out to be eventful one for Davisson. In August he married Owen Richardson’s sister. Soon after that he began work as an assistant physics professor at the Carnegie Institute of Technology in Pittsburgh, Pennsylvania. He spent the summer of 1913 at the University of Cambridge’s Cavendish Laboratories with J. J. Thomson, discoverer of the electron. In 1917, age 35, Davisson’s career changed forever when World War I forced him to relocate to the Western Electric Company in New Jersey. Although it was meant to be a temporary move, he stayed in New Jersey carrying out physics research for 30 years. In 1925, his workplace name was changed to Bell Telephone Laboratories. Davisson’s earlier work with thermionic emission was invaluable in the war. He led scientific teams tasked with deploying recent research discoveries in high-volume production of vacuum tubes and valves. Other scientists and engineers soon began drawing on his highly tuned problem-solving skills in their work. His ability to get to the heart of problems became so important in the laboratories that, unusually, they offered him facilities and assistants to continue working there after the war, carrying out pure research rather than applied industrial research. He found the offer appealing, because it spared him from the daily grind of teaching duties he’d endured at the Carnegie Institute. Davisson was a trailblazer for fundamental research at Bell Laboratories. His presence turned out to be so fruitful for their technology programs that they began recruiting increasing numbers of pure research scientists. Outstanding scientific breakthroughs followed – for example: Bardeen, Brattain, and Shockley’s 1947 invention of the transistor; and Penzias and Woodrow’s 1964 discovery of the cosmic background radiation, providing hard evidence for the universe’s beginning in a Big Bang. In 1919, Davisson noted that when a beam of electrons encounters solid metal, electrons emerge from the metal traveling in all directions at the same speed as the electrons in the initial beam. The Davisson-Germer Experiment. Image courtesy of Rohan. Davisson believed that by statistical analysis of the scattered electrons’ directions, he could learn something about the metal atoms. He likened this to Ernest Rutherford’s discovery of the atomic nucleus via the scattering pattern of alpha particles from gold leaf. In January 1927, Davisson and his colleague Lester Germer fired a beam of electrons at a single crystal of nickel. The results prompted Davisson to discard his analogy with Rutherford’s experiment in favor of a new one: that of Max von Laue and Lawrence Bragg’s observation of X-rays diffracted by crystals: the phenomenon in the Davisson-Germer experiment was not the scattering of particles; it was the diffraction of waves. Reproduction of the electron diffraction pattern observed by Davisson and Germer. Davisson realized he had made a historic discovery: he had proved that matter has wave-like properties. In 1905, Albert Einstein explained the photoelectric effect, proposing that light has particle-like properties. In 1923, Arthur Compton proved by experiment that light has particle-like properties. In 1924, Louis de Broglie hypothesized that all matter has wave-like properties. In 1927, the Davisson-Germer experiment (and independent experiments by George Paget Thomson & Alexander Reid) proved that electrons have wave-like properties. We now know that dual wave-particle behavior extends beyond electrons to higher rest mass particles such as protons, neutrons, atoms, and even molecules – in fact the diffraction of hydrogen atoms was first observed as early as 1929 by Otto Stern and Immanuel Estermann. The most popular explanation of the wave-particle question, although one not universally accepted, is the Copenhagen interpretation of quantum mechanics. 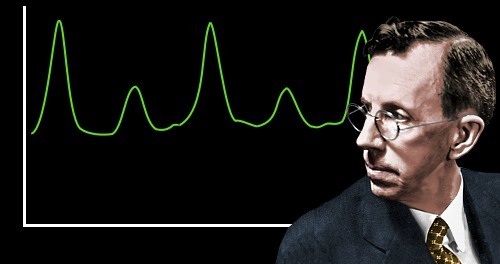 This interpretation, created mainly by Niels Bohr and Werner Heisenberg, says that the method of measurement determines whether a particle or wave will be observed. Following his discovery of electron diffraction, Davisson’s quiet life was disturbed by an avalanche of invitations to write articles for non-specialist publications and to give speeches about his work. He agreed to fulfill a small number of these requests. In 1937, he shared the Nobel Prize in Physics with J. J. Thomson’s son G.P. Thomson, who independently discovered electron diffraction. In August 1911, age 29, Davisson married his doctoral advisor’s sister, Charlotte Sara Richardson. She had come to Princeton to visit her brother, and ended up marrying his assistant. In 1913, the Davissons bought land in Brooklin on the coast of Maine. Several summer vacations later Davisson completed a self-built vacation cottage, where he and his family enjoyed many happy summers. The couple had four children: Clinton, James, Elizabeth, and Richard. Davisson’s favorite pastimes were golf, walking, and ice skating; he also enjoyed playing chess, bridge, and the piano. Shy as a child, he remained modest and retiring as an adult – he had a horror of public speaking, much preferring to deal with colleagues at a personal, informal level. Davisson retired from Bell Labs in 1946, age 65, and moved to the University of Virginia in Charlottesville where, although offered a permanent position, he became visiting professor of physics. He turned out to be an excellent teacher, lecturing in his quiet way to graduate and undergraduate classes. In a repeat of his earlier experience at Bell Labs, he became the first port of call for graduate students and faculty who needed help with physics problems. In 1955, age 74, he retired from the University of Virginia. Although his physical health was now deteriorating, his mind remained keen; in retirement he continued working on theoretical physics problems for pleasure. Two of the Davisson’s sons became physicists: James at the U. S. Naval Research Laboratory and Richard at the University of Washington. Clinton became an engineer. Elizabeth lived with her parents after suffering a very serious illness at age 12; she was still suffering some effects in her thirties. Clinton Davisson died, age 76, peacefully in his sleep on February 1, 1958. He was survived by his wife Charlotte and their four children. "Clinton Davisson." Famous Scientists. famousscientists.org. 25 Sep. 2017. Web. 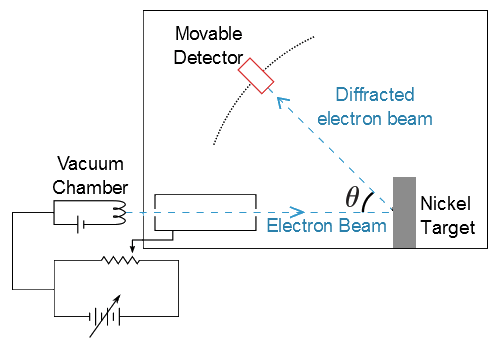 Image of Davisson-Germer Experiment courtesy of Rohan under the Creative Commons Attribution-Share Alike 3.0 Unported license.